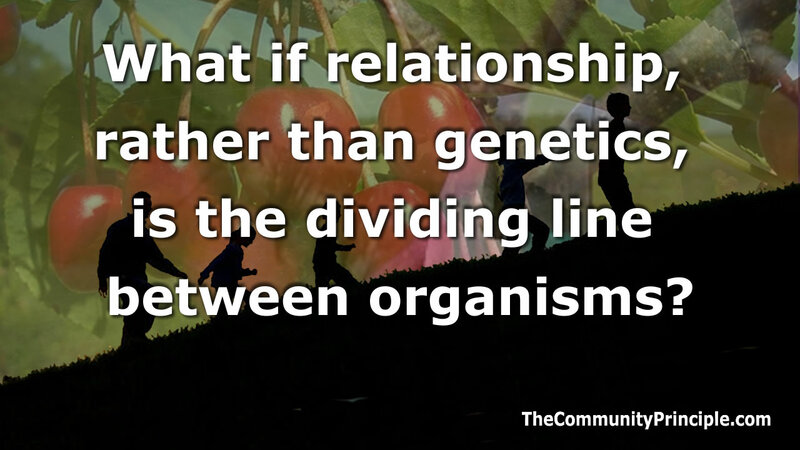 What if relationship, rather than genetics is the dividing line between organisms? In the video below, Gershom Zajicek M.D speaks about certain viruses as necessary (obligate) symbionts; meaning we were once infected with a virus that is now in an inseparable relationship with us. The common idea is that viruses are infections, but he argues that they span the spectrum of relationships from destructive, to beneficial and in some cases, necessary for our survival. Some of these vital viral strings, embedded in our genome provide services such as helping forge the relationship between the uterus and the early stage embryo, the formation of the placenta and so on. Because they offer adaptive advantage they have formed an obligate relationship over time and this is how they get to ride on the wave of relationships we currently call human. One example of the fruits of this relationship is the proto-oncogene which governs cell division. It helps our cells grow and divide in specific and limited ways to form and maintain such things as cells and tissues. In fact, when this process is broken we see cancer. Among the things Dr. Zajicek proposes is that transposable elements (TEs) and Human Endogenous Retro Viruses (HERVs) are two names for the same phenomenon. Transposable elements are snippets of DNA coding that can communicate one cell to another, or across organisms or species, and changes the way an organism operates. This means they can actively modify biological functions during the lifetime of an organism. This method of evolution may need to be added to the currently understood mechanisms which include , descent, genetic variation, mutation, genetic drift, natural selection, and coevolution. If HERV’s and TE’s are synonymous, this would have enormous implications not only to evolution, but to many other disciplines such as medicine, ecology and so on. TE’s, for instance, may be in some cases an immune response from one creature to defend against what it perceives to be a pathogen (from its perspective). We would receive this as a disease. There may be vectors, such as bacteria that mediate this process. If we look through this lens, we see the dynamic root of many of our own diseases in the way we relate in the context of the larger biological body of which we are part, and on which we depend for nourishment. Of course, whether this vision is an ghost due to the lens or a clear image of what is really going on remains to be seen. If we expand the notion Dr. Zajicek proposes on to the larger biological relationship landscape, this would indicate there is an active dynamic and far less than random communication flow by way of meaningful structures, not only within species, but between them. It would mean that species may not be the level at which we should define organisms, but by relationship spanning from antagonistic to obligate. (Necessary). If we were to apply a ven diagram to the biological landscape, we would see many overlaps that violate what we have traditionally considered species. In other words, defining organisms by genetics alone may have blinded us to how the larger, more revealing biological relationship landscape works. While we have a long way to go to unravel this Gordian knot we call biology, if this proves true, it would explain quite a bit, have enormous predictive capacity, and if applied properly would have a huge impact on our understanding of evolution on many levels beyond the scope of Mendelian (inherited) genetics. This video is a perspective on what’s important. What is important? How would we measure it, and how would we know the measure was accurate? Although there are many possible ways, if we use a scale of things that have the most profound influence on our ability to realize our full potential, and use that to measure what we currently apply our energies to as a global culture; we can see the gap, the gap between what’s important, and what we do. Somewhere in our not so distant past, on some day we couldn’t pinpoint because we weren’t watching, we crossed a critical threshold. We crossed the threshold where we no longer live in a world where people starve because we can’t feed them; we now live in a world where people starve because we don’t feed them. We have the skills and resources to make this a plentiful world, but we do not yet have the focus, nor the will – to do what’s important. We have the capacity to cultivate a world brimming with potential – potential that can only be realized if we have each other’s backs. Instead we live in a world where, acting out of fear, we have to watch our backs – a world where we have to defend ourselves from ourselves. Maybe we don’t recognize this is the recipe for self made poverty – maybe we are suffering the echo of our collective traumatic past, where a veil of ignorance forced us to be at the mercy of a frightening and often cruel environment, and as a result, we learned to exploit each other, to dominate, or be dominated… This is a past we need to navigate away from if we’re going to cultivate our full potential. Until we do this, we will continue to rob ourselves of what’s important. What’s important is you – the family, who shapes the lens through which the child understands reality by the way you treat them and each other. You forge their developing identity in the fires of the relationships you expose them to, and this defines whether that fire will refine them, or destroy them. You are the port from which the child launches, and you define what that child will be equipped with to navigate the wider social seas, and how they will influence those they touch – for the rest of their lives. You are what’s important. What’s important is you – the teachers, who have the wheel that steers the future as you pass the torch of knowledge to the next generations. You’re not merely an installer of facts, but a primary cultivator of the tools that will determine whether we will capably face the challenges that lie before us, or sink under their weight. You have a powerful hand on the rudder that steers this Earthen ship of ours through sometimes troubled waters. Together with the family, you set the tone for the direction we will travel. You are what’s important. What’s important is you – the friend, who doesn’t have to be asked, but actively seeks to offer your best. Your behavioral vocabulary doesn’t include apathy. You willingly act on behalf of your friends – ready to deliver a comforting word, a helping hand, or a stinging challenge depending on the need – your purpose remains constant – to serve each other. You have a powerful hand in the stability of this Earthen ship in which we all ride. And your aid through the storms, and companionship in fair weather, makes this journey we’re all on worthwhile. You are what’s important. What’s important is you – the stranger, who may not be familiar with those in other ships that pass by, but know that they are full of kindred kinds – you who understand that it takes all of us, communicating through actions big and small, that we’re in this together, that we share the same waters – and that sharing what we have of value with each other is the reason for the abundance we have. You are the one that opens the door without being asked – you don’t hesitate to act to strengthen the larger community of life on which we all depend for breath because you know you are part of that same body. You are what’s important. And what’s important is Earth – it is our common ground and our greatest teacher. On it we can stand together and flourish – or divided we can fall back into the soil which once generously gave us this opportunity for a plentiful life. Earth has given us what we need and taught us by writing its lessons into the fabric of who we are – like the need to strike a balance between give and take that’s written into our breath… and how all it asks in return is that we recognize that using that breath to cultivate fruitful relationships is what’s really important. The Japanese have a word “kodokushi” that means “lonely death”. It refers to people who died so socially disconnected they got noticed as a result of unpaid bills or the stench of their decay. From a wider view, this kind of death is an expression of social stress on a cultural level. It is increasing in places like Japan, where an individual’s social identity has been strongly tied to what that person does – their status in an atmosphere of decreasing opportunity to fulfill roles of that nature. When jobs dry up in a culture that heavily associates social identity to roles such as work and status with nothing of merit to replace it, so does a person’s social life and identity. This type of expression of social stress is also true in the context of cultures that use unspoken inferences to imply false paths to satisfaction like; monetary and or material success is the path to satisfied social standing. Or a celebrity culture,where popularity is equivocated with success and satisfaction. In these cases it sometimes leads to the opposite; isolation in the form of a prison of superficial relationships and a servile life of superficial show that looks enticing from afar, but is quietly alienating and unsatisfactory to those within its grips. The false illusion can ultimately craft a pluralistic ignorance engine in the culture where people are enchanted by the notion and spend their lives desperately chasing the empty dream – the missing piece of satisfaction that is never to be found in a social maze that is actually a prison disguised as a prize – with only the promise of fulfillment, but no actual satisfaction. Expressions of stress due to cultural identity crises happen anywhere there is a false path to satisfaction, but also anywhere a former means of forming a social identity is shattered and a path for a new social identity is not clearly established. When disruptions to the social economy, and by extension our connections to each other, are stressed and or destroyed, we become displaced and exhibit stress responses. Various exhibitions of stress like kodokushi are the result in individuals or whole cultures displaced by changes in the environment for which we are ill equipped to adapt. We have witnessed this identity problem in indigenous people’s throughout the world. Those that have been displaced by western civilization suffer in the wake of social economic stresses. The basis by which the people established their identity was destroyed, and with it, the people. Where the means to form a valuable identity in a social context is disrupted, and no clear alternative path to cultivate a solid socially valued identity is presented, much less cultivated, we see expressions of stress. These social malnourishment stresses are expressed in many forms, including kodokushi. Sometimes self destructive alienation and deterioration take the form of life ending addictions, crime, and other predatory acts such as abuse, or in the case of western technological societies; a sacrifice of quality intimate relationships for gadgets, entertainment and superficial social posturing, none of which are fitting staples of nutrition for our innate human social hungers. As a result, we elevate the most vacuous inconsequential banalities to the status of ultra importance and proceed to swarm on it as if it had real merit – a cycle of self perpetuating distractions that keep us from addressing the reality of our desperately unsatisfied state. In the west, our fickle passion for a flurry of distracting gadgets and banalities increasingly consumes our time, but does not lead to fundamental satisfaction. As we have distanced ourselves from nature, we have distanced ourselves from ourselves, and this has led to many expressions of cultural stress. When displaced from satisfying forms of social nutrition, we become socially ravenous creatures, desperately consuming anything that remotely looks like food, including social junk food, and each other, for the sake of forging a social identity – even if that identity is an unsatisfying and self perpetuating farce. On a larger cultural scale, these expressions of cultural stress are the pre quake tremors that precede a much larger tectonic shift laying at the threshold of our near future. One of the fundamental challenges we face as a global culture is how to establish a satisfying identity in the context of the fact that our material needs will be increasingly met through technology. As technology increasingly replaces the need for human participation in the traditional hunt-gather-perform aspects of human sociality, we face a social identity crisis of unprecedented proportions as a species. Our traditionally formed social identities were based on necessary roles which are now increasingly being displaced by automation. If we do not act preemptively to craft a a new social economy, we will face the backlash of stressed humans desperately trying to get their bearings in a world we longer understand. As we are carried forward on the inevitable currents of time that move us toward the future, in order to succeed, we need to understand that we are primarily social creatures with material needs – not material creatures with social needs. It has always been so, although the social currency has been historically based on material, this is changing and we need to adapt, or suffer the consequences of maladaptation. Although we have historically conflated material needs with social ones out of necessity, as this base erodes we need to recast our understanding of ourselves. We need to focus in on what has always been the driver of human satisfaction all along, sociality. This is the common denominator, and of paramount importance to recognize to successfully move forward. With this in mind it is perhaps wise to recognize that we are entering the social age. As technology increasingly fulfills our material needs, the stability of our future will need to be built on what we bring that is of social value, rather than what has been of material value. This requires some rewiring of our traditional perceptions of what is of value. We need to move from material mindset to a social one. It is not a mistake that the stone age, bronze age, iron age and the industrial age gave way to the information age. The move has been from material to non-material values. We must now recognize now that the common denominator that has always been social. The variable has been what fills our fundamental hierarchy of needs. Social is what we must now put at the forefront of our understanding of what is of value. Adding value in a social context is what we need to recognize, cultivate and strive for as humans in order to have our bearings in the social age – in order to adapt. Our attempt to fill our social needs with materials pays an ever diminishing return on our level of satisfaction. This is based on the law of supply and demand. The degree to which we make the transition to the social age economy effectively is the degree to which we harmonize with what has been at the foundation of our human nature all along – and that is social. Delivering products of constructive social value is heart the new economy.